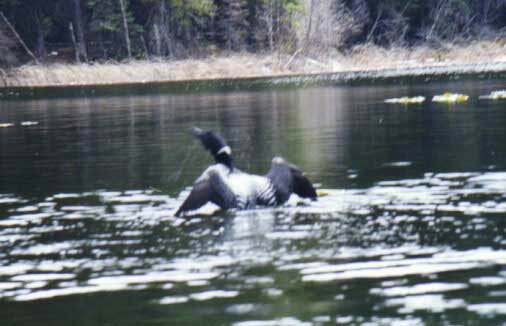 While paddling our canoe silently into one of the marshland coves of beautiful Roche Lake, we came upon a pair of Ring Necked Loons. Breathlessly, we drifted toward the thrill of this awesome sight. Suddenly, noticing we were there, one proceeded to display, just in time for a picture. They dove; when next we spotted them, they were far away, almost at the center of the lake. We paddled on. Thank you for visiting Wolfden.